This website is for Indians in Germany, by Indians. We welcome you to GermanyMantra.com ! There are about 68,500 Indians in Germany most of whom are working as professionals and self-employed. 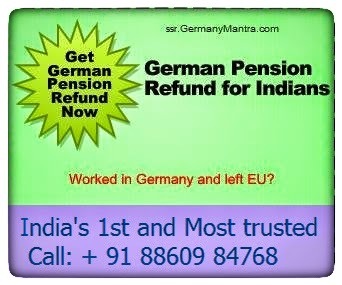 This website is dedicated to Indians in Germany to provide one stop solutions to their common queries. We intend to provide information about Germany with the context of Indians. We are Indian and understand Indians, and hence provide information in the relevant context. The basic aim of our website is to make the stay of Indian students, employees, spouses, children etc. comfortable in Germany. The key mantra of this website is to provide only the relevant and practical information. We would like to keep in theoretical information separate so that newcomers to Germany feel comfortable without getting lost with information overload. We hope that together we can make Stay in Germany comfortable for all. This website is a Wiki. We invite you to update this website with your knowledge about your experience in Germany. Just write us and you can become member. Final reminder to file German tax return for year 2012 !! 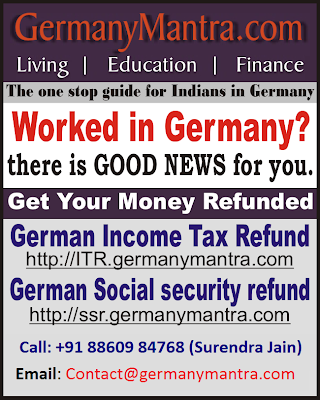 Last opportunity to file German tax return for year 2012.File tax return by December 2016 !! It's now or never. Give your feedback here. No login required. Where to open bank account ? Is it availale for Family?